Nestled amongst woodland and fields near Bologna and Florence, our peaceful villa is the perfect for families or groups. The villa boasts a large private swimming pool, terraces, stunning views, and comes fully equipped with all mod cons. All areas are air conditioned. Our spacious terracotta villa is ideal for groups or families with a well-equipped kitchen diner, spacious sitting room with wood burning stove, 5 bedrooms and 4 bathrooms. Its pergola-covered terraces provide stunning views of the surrounding landscape and offer multiple places to relax, read a book, or enjoy al fresco dining. The large 12 x 6 metre swimming pool is an ideal spot for sunbathing with its comfy sun loungers and umbrellas. Inside, the large sitting room with its 42-inch satellite TV, iPod dock, books and board games, is certain to keep all entertained. The open plan kitchen provides a fantastic space for cooking a meal with loved ones with its wooden beams, large Range Cooker, microwave, dishwasher, and dining area with french doors leading to a shaded terrace. There is also a large Weber barbecue for cooking outside during the warm evenings. Upstairs, the first floor offers 3 large bedrooms with king size or twin beds. All bathrooms, including one en-suite, are equipped with power showers, modern wash basins and bidets. The barn, located just 6 metres from the villa, provides separate accommodation, making it ideal if you are staying with another family or group and want your own private living space. Inside, the ground floor offers an open plan living area with sofas, satellite TV and wood-burning stove, a fully-equipped kitchen, dining area with table, and small terrace. Upstairs, there are two bedrooms, one with a king size bed and another with twin beds, and one bathroom with power shower, modern wash basin and bidet. Situated on a hill and surrounded entirely by nature, the setting offers stunning idyllic views and the opportunity to see wildlife such as wild hares, deers and porcupines, as well as plentiful opportunities for walking, playing and exploring. In the summer, you can enjoy horse riding, cycling, tennis, or canoeing, whilst in the winter there is skiing and hiking on the local ski slopes of Sestola and Corno alle Scale. In the heart of Italy's finest culinary region, Emilia-Romagna, you are best placed to sample Italy's most delicious foods such as parmesan cheese and parma ham. The nearby town of Vergato offers an insight into authentic Italian life with its quaint piazza, shops, restaurants and Monday market selling everything from fresh cheeses to clothes. For art, culture or shopping, the villa is located just a 40-minute drive from Bologna where you can enjoy concerts, opera or art shows, or for those wishing to relax and be pampered the thermal baths at Porretta Terme and Pistoia are just a 30 minute drive away. Italy's other major destinations, such as Milan, Florence and Venice, are easily accessible. The villa is also just a 35-minute drive from Maranello where there is the testing track and museum for Ferrari Formula 1; ideal for motor sport fans! As a Brit who divides her time between the UK, Europe and the Middle East, I realise how special each holiday stay is for visitors. I like to give extra special service to people visiting to make their stay special. I enjoy travelling, new experiences and meeting new people - I would love to spend more time exploring Asia, America and of course Italy. After holidaying in Italy for 10+ years, we purchased Casa Ruspiano in 2005. We completely restored the villa and barn during 2007 and more than doubled the available living space. Plus added all features that you would expect of a modern villa without loosing the classic Italian style. Of course to enjoy those long hot Italian summer's we added a large swimming pool too. We love the location - set in it's own private grounds with stunning views. Also located just 1.5 kms from a major town. We can enjoy our stays but also access the daily essentials supermarkets, restaurants, train stations etc with ease. Location, Location, Location is everything. Nearest restaurant 10 mins walk, just 1.5 kms from a major town, 40 mins from the nearest international airport, 40 minutes from Bologna and 60 minutes from Florence - just perfect. toilet, combination tub/shower, bidet, There is also a wash basin provided. toilet, shower, bidet, There is a wash basin provided. Located on ground floor. toilet, shower, bidet, There is also a wash basin provided. We offer guests the use of an Italian mobile phone. The villa and barn have underfloor heating through out plus 3 modern wood burners. Note gas for heating is charged at cost and wood for the burners is supplied free of charge. There are 2 washing machines. The villa has Wi-Fi provided via a satellite dish. Should guests require the use of a fully equipped gym, there is a great gym in the local town with day passes available. There are 3 modern wood burners at the property. We supply wood free of charge. There are 2 living rooms - 1 in the villa 30ft long and also an open plan area in the barn. Both have TV's DVD players and iPod docks. Plus comfortable leather sofas. There are 2 refridgerators in the villa - perfect for foods and keeping drinks cool. In the barn there is also fridge freezer. 6 burners range cooker with double oven. As well as a traditional Italian café maker. We also have a Nespresso café machine. Please bring your own capsules for use. We supply a small supply of condiments - salt, pepper, herbs and oils. Both the Villa and Barn have fully equipped kitchens and dining area. Large table in the villa comfortably seating up to 12 people and the dining terrace outside also seats up to 12. There are 2 TV's at the villa. We have satellite TV showing a range of channels from around the world. We have an extensive DVD collection of 200 plus films, with many recent releases. Low maintenance with twice weekly visits from our gardener. There are 2 local lakes - 30 mins drive from the villa with boating facilities. Can be hired locally. Details provided in our Welcome book. There are 3 terraces - 1 for dining and another for relaxing. There is also a large terrace at the pool with sun loungers. There are 2 local slopes for skiing - Corno Alle Scale. Just 30 mins drive plus Sestola, which is 50 mins drive. Tennis courts are located 5 mins drive from the villa. Details regarding rental are provided in our Welcome Book. A golf course is located 30 mins drive from the villa. Details regarding rental are provided in our Welcome Book. The villa has a full downstairs bathroom. All bedrooms are on the first floor but we can set up a bedroom on the ground floor if required. The pool is superb and maintained twice weekly. Measuring 6 x 12 metres with 10 comfortable pool loungers and 4 umbrellas. It's a great spot to relax. The villa and the barn have recently been restored and include cool terracotta floors, screens in bedrooms and bathrooms, underfloor heating. The 4 spacious bathrooms with powerful showers. The villa is excellent for children with open spaces and outdoor fun, there is a pool so parents must make sure that they do not leave minors unattended. High chairs and travel cots are provided. Outside: Large private pool 12m x 6m with stunning views and terraces great for sunbathing or al fresco dining. There are 3 large terraces with 3 big umbrellas and smart sun loungers. The large terracotta terraces areas located outside the kitchen, sitting room and by the pool have smart furniture to dine or simply unwind and enjoy the views. Over 30 years ago Casa Ruspiano was one of the largest farming estates in the area. Today many of the fruit trees are still active producing mainly plums and pears. This area is beautifully kept with working farms close by selling organic foods. Utility Room: 2 washing machines, ironing boards and irons, drying racks and rotary line available for use. Cleaning / Towels / Linen / Maid service: Pool and bath towels and linens provided. Additional housekeeping and Executive Chef available, details on request. Other: The recent restoration of the house has created an enormous kitchen and dining area with large beech table and 10 chairs. Great for entertaining and sociable evenings. This was a beautiful place to wake up to and begin our day and an extremely relaxing spot to return to after our adventures in Emiglia-Romangna. One can not be anything else but calm in this spot. The property was very accurately described and it offered all of the described facilities, location features and layout. The house was very clean and well maintained. Customer service - as in knowing the ins and outs of the house - could have been a bit more explained by the house/key keeper. However, the written information was very elaborated. We would certainly recommend this property to family and friends. Especially through its extra features on top of all great facilities: the visit of deers and boars during the night. They are not dangerous, but very exciting to look at. In addition, the Chef Cook Angela, a local cook who prepares and serves a delicious meal using local dishes: a real special treat ! The location is very close by to a number of great cities: Bologna, Ravenna, Modena, etc. The local town provides for all shopping needs. We stayed as a family of 9 for 6 wonderful nights at Casa Ruspiano occupying both the main house and the converted barn . The property is very large, comfortable and well equipped . It is very picturesque, quiet and serene. The children loved having plenty of space, as well as being very excited when they spotted wild deer and hares. The swimming pool was kept very clean and pool towels were provided. Having a very large kitchen, lounge and outside patio with a barbecue made family meal-times easy and enjoyable . We explored the small town of Vergato on market day to buy lovely fresh produce . We used the train from Vergato station to travel and explore Bologna ,Parma, Modena and Ravenna. Some of the family took one of our hire cars and drove to Pisa as well as Venice. Should the opportunity ever arise again we would certainly choose Casa Ruspiano! The property is about 2 kms from Vergato up a steep,winding road ,so accessing shops, restaurants or the train station would be quite difficult without a car. This is a popular area for tourists, walkers, cyclists and visitors wishing to access both Tuscany and Bologna. Not forgetting Bologna's reputation for the best food in Italy - this is also a popular location for Tartuffo and Wild Boar cuisine with a Michelin star restaurant less than 40 minutes away. Horse riding and tennis courts are also available locally. You can also access Venice, Milan, Ravenna, Ferrara for day trips too. The closest beach is at Rimini 175km from the house by car. The beaches are sandy, well organised and very pleasant. Most have loungers and bars attached to them where you are served drinks/food on request. The Italian Lakes, Venice and Cinque Terre can also be accessed for great days out. Especially for the kids there is a Aqua Park less than 40 minutes from the property. Florence (FLR) Meridiana/Air France/KLM/Lufthansa/Alitalia -89km. Pisa (PSA) BA/Easyjet/Air France/Lufthansa/Thomsonfly/Alitalia -120km. The Villa is 15 minutes from the tuscan border with Florence just 1 hour away by train or car. Emilia Romagna is Italy's finest culinary region, home of balsamic vinegar, parmesan cheese and parma ham with Bologna, its capital, voted the place Italians would most love to live, this is truly La Dolce Vita, with art, culture, tradition, museums, palazzos, piazzas, churches, towers and superb shopping. 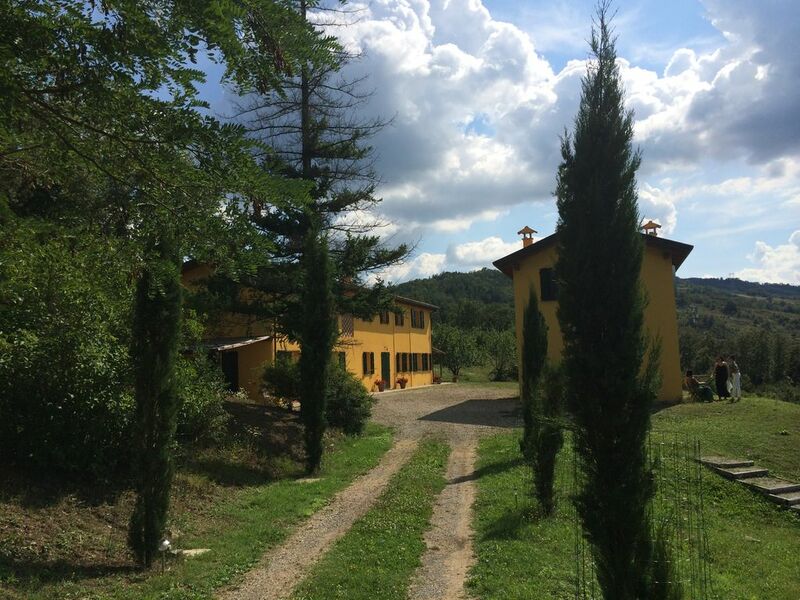 The villa is situated between Bologna and Florence, two world famous Italian gems the villa is within easy distance of major destinations such as Bologna, Florence, Lucca, Verona, Siena, Venice and Milan. Wine lovers can visit Tuscany and Coli Bolognese; for spa opportunities you can chill out in the thermal baths in Porretta Terme and Pistoia – just 30 mins by car. In the local town of Vergato just 1.5 km from the Villa, enjoy a morning caffe' or drink in the piazza while watching real Italian life. Vergato has all of your immediate needs from supermarkets, pharmacies, shops, restaurants and railway station – don’t miss the Monday market selling everything from fresh produce to clothes. Plus there is a wonderful restaurant just 10 minutes walk from the Villa, where you can enjoy wonderful Bolognesei cooking at very reasonable prices. There are concerts (classical, brass band, jazz, modern), opera, art shows in Bologna, Pistoia Jazz festival, the Porretta Soul Festival, and a host of other events throughout the year. Other local activities include cycling, walking, tennis, canoeing and horse riding. In the autumn and winter months there is skiing and hiking at the local ski slopes of Sestola and Corno alle Scale, both are less than 60 minutes from the villa. After exiting the A1 Autostrada at Sasso Marconi, follow the SS64 road for 22kms, the villa is located near the town of Vergato, between Bologna and Florence. The Villa is at the end of a 100m gravel road (strada bianca) maintained in good condition and there is plenty of space for parking. We can also offer the services of an excellent Executive Chef, who will come to the villa and cook lunch or dinner for special events. For Spring and Autumn lets - we provide free wood for the wood burners. We have a fair energy usage policy - your booking includes a credit for energy, emter readings will be provided and usage beyond the energy will be charged at cost.